Apple introduced a University Student membership plan for Apple Music in May this year. The plan that was limited to only seven countries then is being expanded to 25 new nations including India. This membership cuts the cost of Apple Music subscription by approximately 50 percent for students enrolled in a college or university. In India, the Student membership plan will cost Rs 60 per month. This means now there are three plans for Indian users- Individual, Family and student. The Individual plan as we all know is priced at Rs 120 per month. The Family Plan that lets up to six people share the subscription costs Rs 190 per month. To verify the eligibility of a student, Apple has partnered with a student validation service called UNiDAYS. Students need to enter their email address and name of the school/university to verify their eligibility. Once verified, the University Student plan is activated for the subscriber at a discounted rate. The discounted membership price is valid for up to 48 months or four years, however, the time span does not need to be continuous. The authentication is not one time either. UNiDAYS regularly checks if the subscriber is still a college student while your Apple Music subscription is still active. 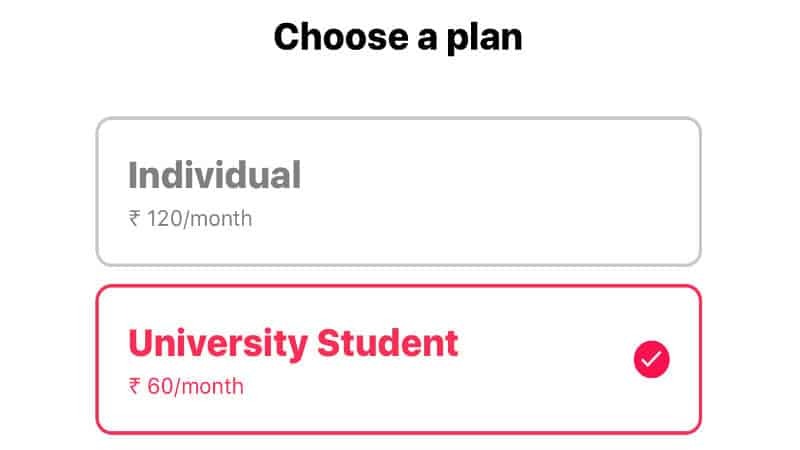 If it finds that the subscriber is no longer a student, it will automatically stop student pricing and switch the user to the full individual pricing plan. Apart from India, the Apple Music Student Membership has been extended to Austria, Belgium, Brazil, Canada, China, Chile, Colombia, Finland, France, Hong Kong, Indonesia, Italy, Japan, Mexico, the Netherlands, Norway, Russia, Switzerland, Singapore, South Africa, Spain, Sweden, Thailand, and the United Arab Emirates.